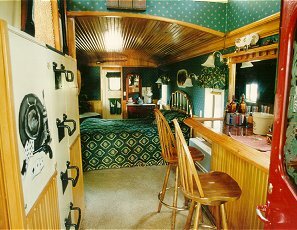 "You are bound to fall in love with this assemblage of vintage cabooses." -Marilyn McFarlane, Best Places to Stay in California. On the shores of Clear Lake, The Featherbed Railroad Company is situated in a park-like setting amidst ancient sprawling oak, bay and redwood trees. Each caboose is unique. Luxuriously appointed, each has all the amenities of a fine hotel. 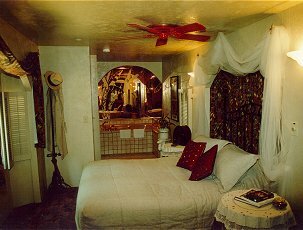 - full size bath, (most have Jacuzzis), Cable color TV/VCR, small refrigerator, heating and air-conditioning, and, of course, wonderful, luxurious, featherbeds! Start your day sipping your favorite wake-up beverage as your morning newspaper is delivered directly to your door. Walk over to the "Main Station," our 100 year old ranch house, where we serve you a delicious, filling full breakfast - with its beautiful view of the park and lake, (or in front of a cozy fire in winter months). Take a dip in our private pool and spa or perhaps take a ride on one of the bicycles we provide for our guests. Later, relax in a hammock or, for excitment, jet skis and boat, rentals nearby. You can also play golf or tennis nearby. 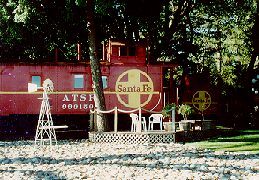 We think there is something for everyone here at the featherbed Railroad Company and we look forward to seeing you soon. Your Hosts: Len & Lorraine Bassignani. 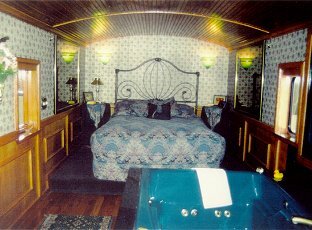 Rates: Cabooses start at $140-180 per night but vary according to caboose and season. Reservations necessary. First night's lodging in advance. Three days notice required for cancellation refund. MC/VISA/AMEX/DISC accepted. Prices and terms subject to change without notice,. Beer wine and soft drinks sold on the premises. Sorry so pets. Gift Certificates Available. This and other Clear Lake Bed and Breakfast Inns can be found here in The Register.